As long as no life is lost, difficulties are good. Physical exercises strengthen our bodies. Mental exercises (reading, writing and thinking) strengthen our minds. 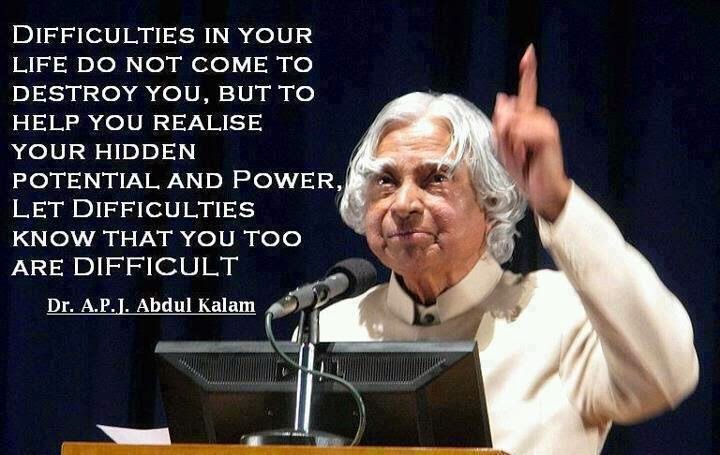 Difficulties strengthen our inner being, the real us. I love this letter by Abraham Lincoln to his son's headmaster. And I will put in bold the part I want you to take special notice of. My son will have to learn, I know, that all men are not just, all men are not true. But teach him also that for every scoundrel there is a hero. That for every selfish politician, there is a dedicated leader. Teach him that for every enemy there is a friend. It will take time, I know; but teach him, if you can, that a dollar earned is far more valuable than five found. Teach him, if you can, the wonder of books. But also give him quiet time to ponder the eternal mystery of birds in the sky, bees in the sun, and the flowers on a green hillside. Teach him to listen to all men. But teach him also to filter all he hears on a screen of truth and take only the good that comes through. Teach him if you can, how to laugh when he is sad. Teach him there is no shame in tears. Teach him to scoff at cynics and to beware of too much sweetness. Teach him to close his ears to a howling mob and to stand and fight if he thinks he's right. Let him have the courage to be impatient, let him have the patience to be brave. Teach him always to have sublime faith in himself because then he will have sublime faith in mankind. This is a big order, but see what you can do. He is such a fine fellow, my son ! Only the test of fire makes fine steel. Here is another popular letter, by Richard Paul Evans the author of The Christmas Box. I am so very proud of you. Now, as you embark on a new journey, I'd like to share this one piece of advice. Always, always remember that - adversity is not a detour. It is part of the path. Your challenges, if you let them, will become your greatest allies. Mountains can crush or raise you, depending on which side of the mountain you choose to stand on. All history bears out that the great, those who have changed the world, have all suffered great challenges. And, more times than not it's precisely those challenges that, in God's time, lead to triumph. If I wanted to bold anything in that letter, it would be the entire letter. And I'll end with a memorable quote from Sir Isaac Newton.